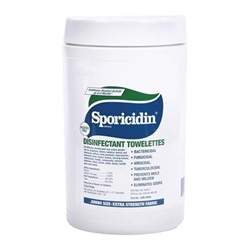 Sporicidin towelettes that measure 5x8 inches. 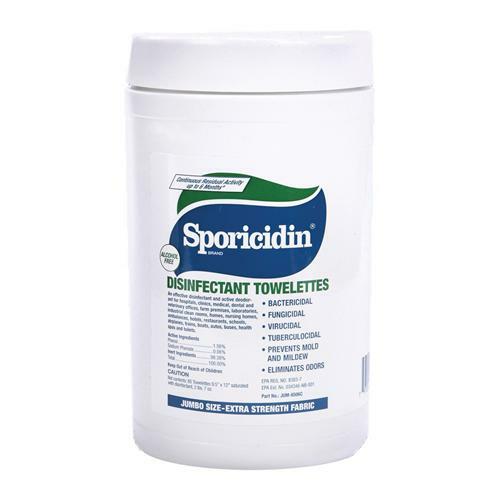 Sporicidin has the most neutral pH of any phenolic based disinfectant. Sporicidin towelettes that measure 5 x 8 inches. Has a fresh scent and is manufactured by Contec. Cleans, disinfects, deodorizes. Provides 100% kill of pathogenic vegetative organisms, including MRSA, VRE and Avian Influenza A Virus (H9N2 and H1N1). Continuous residual activity up to 6 months. Compatible with plastics, wood, glass and metals, alcohol-free Sporicidin Disinfectant is non-staining, non-abrasive and non-corrosive. Comes 180 wipes per canister.